Roasting brings out the essential flavors in vegetables, requiring very little additional seasoning. “The basic techniques, such as roasting, are so simple. It’s the combination of technique and unexpected ingredients that makes the magic…such as adding a touch of mint or a brushstroke of chipotle honey glaze to finish,” explains Clifford Pleau, Corporate Executive Chef for Seasons 52. Pleau encourages home cooks to experiment with produce and items that are new to them. “If you are unfamiliar with something, bring it home and apply the basic roasting technique.” For example, at Seasons 52 Delicata Squash is cut in rings and roasted, then topped with a chipotle honey glaze. Pleau recommends roasting the squash for 25 -30 minutes at 350 degrees. “Just season with salt, pepper and spritz of olive oil,” he adds. Get your family hooked on Brussels sprouts, by first blanching and then roasting and finally tossing with a few roasted garlic cloves. Cut cauliflower into large chunks, season with curry powder, salt and pepper, and olive oil. Place cauliflower pieces in a pan, cover and roast for 20-30 minutes at 350 degrees. Finish with a sprinkle of minted breadcrumbs. “Fresh mint is an underused herb that adds terrific aroma and interest to a dish,” explains Pleau. When roasting fruit, nature provides its own glaze. The season’s finest pears have a savory complexity best appreciated when roasted. “This fruit is so amazing, it actually glazes itself with its own sugars…the sugars rise to the top while roasting,” says Pleau. A gentle brushstroke of olive oil and a sprinkle of salt and pepper is all Chef Pleau needs to concentrate the natural sugars in these gorgeous fresh pears. Oven-roasting yields a fruit with a rich caramelized taste. Finished with a cranberry chutney, the pairing is perfect with our Wood Roasted Pork Tenderloin or Springer Mountain Farm All-Natural Grilled Chicken. See recipe below. Let simplicity drive your culinary techniques, keeping the emphasis on roasting. Set the logs on the fire, pour the wine, invite the neighbors over and serve nature at its best. • Preheat oven to 425°F. • Wash pears and cut them in half, lengthwise. Pat dry. • Toss pears with olive oil and salt and pepper in bowl. • Lay pears on baking dish skin-side down, cut-side up. 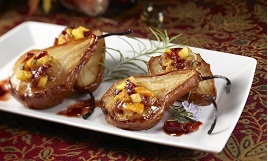 • Roast pears in 425° oven for 15 minutes. Rotate tray. Continue cooking 15 minutes until soft and caramelized. • Remove from oven and serve as an accompaniment. • Top with chutney or cranberry relish for added touch.